Cabo San Lucas is an anchor port for all cruises sailing on Mexico's Riviera and Sea of Cortez itineraries, but passengers are a small minority of the tourists who flock there. The heavily Americanized party town serves as one of the most popular beach escapes for Californians and other West Coasters who come here to let loose (spring break festivities are intense and not a proposition for the faint of heart). One of Cabo's major attractions is Cabo Wabo, a cantina owned by rocker Sammy Hagar. Rocks of a different sort -- El Arco, with its jagged points protruding from the Sea of Cortez, make more impressive photos. Yet for those passing on the beer-pong tournaments and temporary tattoos, Cabo has a lot to offer. Located at the southern tip of the Baja Peninsula, Cabo San Lucas -- together with its more elegant and much quieter sister town of San Jose del Cabo -- is an ideal spot for adventure-oriented pursuits. If conditions are right, the clear waters make for great snorkeling kayaking, stand-up paddleboarding, parasailing, sailing and jet skiing. The Sea of Cortez is among the biologically richest areas in the world, with pods of whales that winter offshore; if you're here in season (late December through late March), a whale-watching trip is a must. Cabo also has some of the best sportfishing in the world, and it is the quest for marlin that put the town on the map. After World War II and the advent of private planes, Hollywood royalty such as Bing Crosby and John Wayne arrived to fish. In the 1970s, a highway was built to connect California to Baja, and the travel industry began in earnest. Now, it's hard to open a celebrity magazine without seeing photos of A-listers lounging at the six-star resorts that have sprung up in "The Corridor," as the coastal stretch between the two cities is known. One of the downsides for most cruise travelers: There's no cruise pier, so all ships must anchor and tender passengers to the port. That means you'll need to factor in extra time getting to and from your ship. Even odder is the fact that some ships only stop for half-day visits, which means that actual on-land time can be extremely limited (although excursion providers usually time their tours to meet the needs of cruisers). 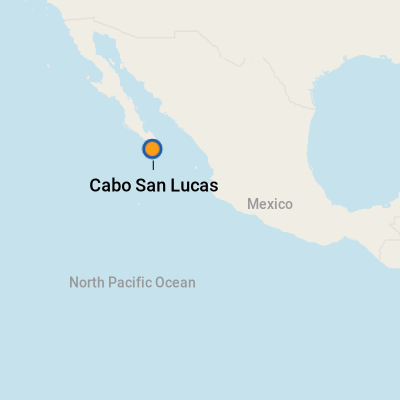 However, other ships spend two days in Cabo, allowing passengers to stay out until 9 p.m. before the ship maneuvers offshore to open casinos. If you're one of the lucky ones with a longer port time, greater Baja, including daytrips to Todos Santos, are within reach. Up to four ships can anchor offshore and tender passengers (about a 10-minute ride) to the marina, which is a pleasant 15-minute waterfront walk to the heart of Cabo San Lucas. Ships tender in Cabo San Lucas Bay, near El Arco, or Land's End. At the cruise pier end of the marina, you'll find excursion operators, water taxis, Senor Frogs, ATMs, souvenir stands and a Starbucks. Not shy about pursuing cruise ship business, the town is usually wide open at 8 a.m. (you can have breakfast at the marina or even go parasailing that early). The pelicans already are out and about, too. Vendors aren't shy in Cabo, and you'll find yourself repeatedly telling people "no" as you stroll the marina or sit on Medano Beach (to avoid vendors on this packed stretch of sand, ask for a table or lounge chair farther back from the beach or buy a hotel beach pass). We also had to make sure that waiters wouldn't bring us drinks we hadn't ordered; check your bill closely before paying. By Foot: It's an easy 15-minute walk from the cruise ship pier to the main drag via the pleasant and well-marked marina. By Water Taxi: At the cruise pier, you can get a water taxi to take you to Medano Beach for about $10. If you want an up-close view of El Arco,a glass-bottom boat will take you out there, as well as to Pelican Bay, for about $20 for a party of four. Always negotiate your fee in advance. By Taxi: Although the center of town is reachable by foot, the heat might make a taxi ride easier. Taxis, mostly of the sedan type (as opposed to safari cabs), line up at the marina. By Car: For explorations beyond the city limits, your best bet is to rent a car; among the agencies with offices in town: National (877-567-3572 or 624-142-2424), Budget (U.S. 800-801-0365 or Mexico 800-002-8343) and Alamo (U.S. 866-365-3530, Mexico 800-821-6522 or 624-143-6060). ATMs are widely accessible if you want to get Mexican pesos or U.S. dollars, which are accepted everywhere. If you are making an expensive purchase in a shop, you are best off paying with a credit card. Having dollar bills to pay for cab fares and trinkets is helpful. Locals speak Spanish but English is also widely spoken, particularly in shops and tourist venues. There's a sizable American expat population, too. As befits its status as Cozumel of the West, Cabo features plenty of restaurants serving up Mexican food that appeals to American palates such as tacos, burritos and enchiladas. Take advantage of the city's seafood and go for the ceviche, grilled wahoo or whatever else the waiter says is fresh. Perhaps not surprising given the number of health-conscious Angelinos it attracts, Cabo has a reasonable number of places to grab smoothies, and several beach restaurants have sushi on the menu. Medano Beach is full of restaurants and bars where you can rent a chair and umbrella while you eat, drink and sun till your heart's content. Among these, the Mango Deck (open 7 a.m. to 10:30 p.m.) is legendary for its rowdy atmosphere (wet T-shirt contests and staff dancing occurs on a regular basis); it also has a sushi bar. The Sand Bar has a covered deck where beach massages are available daily from 10 a.m. to 5 p.m.; $32 for 50 minutes. A number of Mexican trinkets and souvenirs can be found in Cabo, ranging from Mexican blankets to vanilla beans to tequila. It's hard not to notice the numerous pharmacies hawking prescription drugs such as Viagra, Cialis and Retin-A, among others. While the ethics of buying such items is debatable, we recommend you don't, as the quality and legitimacy of the medicine is not guaranteed. In the land of tequila, the margarita is queen. Several stores along Cabo's main drag offer tequila tastings or dare you to try mescal -- the drink with the worm in the bottom of the bottle (it's better than it sounds, with a smoky flavor reminiscent of barbecue).